When it became abundantly clear at the end of Amazing Spider-Man #700 that the role of Spider-Man was now going to be played by an in-control-of-Peter-Parker’s-body Doctor Octopus, beyond “what’s going to happen to Peter,” my biggest concern and curiosity was how the rest of the Marvel universe was going to respond to Spider-Ock. While some of Spider-Man’s characteristics have come and gone and come back again depending on whoever was writing/illustrating him at the time, his character is certainly well defined enough that it would have been a critical oversight by Marvel to think everyone else in their fictitious universe was unable to see that there was something a little “off” about Spider-Man ever since his epic battle with Doc Ock resulted in the “death” of his arch-rival. 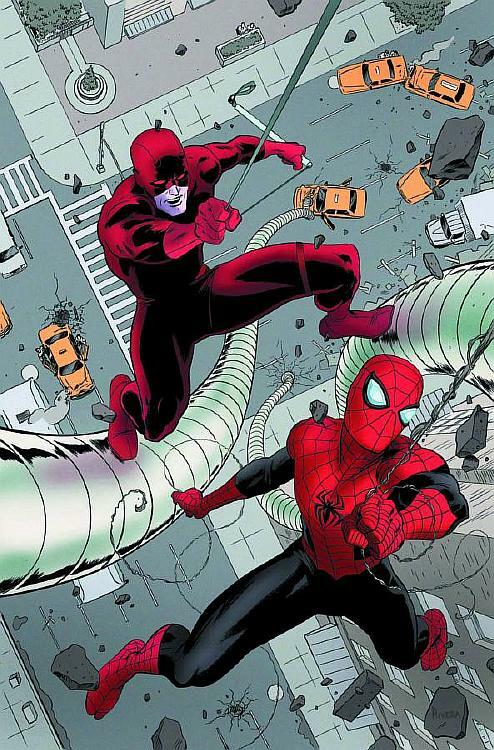 Over the past few weeks, we got to see two new writers take Spider-Ock for a spin in Mark Waid in Daredevil #22 and Chris Yost in Avenging Spider-Man #16 and both immediately addressed the idea that there’s something “different” going on with Spider-Man lately. I appreciated that Yost was able to diffuse Spider-Man’s over-the-top confrontation with the X-Men and Wolverine with some humor – “who here hasn’t honestly wanted to punch Wolverine,” was an easy way to dismiss any out-of-character behavior. I honestly felt a little more conflicted by Waid’s attempts to address the situation. After Spidey-Ock attacks Daredevil earlier, and Matt Murdock himself notes that Spider-Man is not acting himself and not slinging his usual barrage of one-liners and jokes, I had a hard time accepting that a “my bad, brah” response from Spidey-Ock would be all the info Daredevil needed to keep calm and carry on. Then again, since Waid’s job is to use his comic book to focus on Daredevil and not Spider-Man, I guess he had an obligation to keep the story moving and enter the next chapter of the otherwise great work he’s been doing on that title. My take-away from these two comics and of course from Superior Spider-Man #1 earlier this month is that a very consistent character in Spidey-Ock has been created and it appears that Dan Slott, Yost and Waid are all having a pretty good time writing this more arrogant, ego-centric version of Spider-Man. After reading ASM #700 and Avenging #15.1 the day they were released, I had wondered if Slott was going to have a softer-around-the-edges take on the character than Yost and anyone else who was going to tackle Spidey in the coming months. But that’s not the case. Spidey Ock is a bit of a jerk, and is so different than Peter Parker, that even other make-believe characters know something’s not right here. But now I’m wonder if by drawing such a line in the sand, and so soon, if Marvel is opening up a little bit of a Pandora’s Box here with their new status quo. Not so much whether or not the status quo should have been implemented – that idea has been beaten to death and at this point, a month later, I have nothing new to offer up on that topic – but rather whether or not Marvel has inadvertently painted themselves into a corner and reduced the shelf life of their brand new toy in Spider-Ock. I raised this question during my write-up on Avenging and I raise it again: if other characters in the Marvel universe notice that Spider-Man is not himself, where does the story go from there. Sure, they can brush aside for an issue or two, but if it becomes an epidemic – if Spider-Man keeps turning on guys like Wolverine and Daredevil – something will have to be done in this universe to address a superhero who has apparently gone “rogue.” Otherwise, it just makes these heroes look like a bunch of naïve/gullible mopes. And if Spider-Ock cleans up his act enough where his confrontations become fewer and further between, than what differentiates himself from the more clean-cut, conventional Peter Parker as Spider-Man? If the premise of Spider-Ock is for Marvel’s assortment of creative teams to do something different and edgey with the character, it would be superfluous to have Superior Spider-Man find his moral center so quickly. What I guess I’m trying to say in a very roundabout way, is despite the controversy and hand-wringing from many long-time ASM fans, I’m curious to see this new status quo succeed, and succeed in an appropriate amount of time. I honestly do think this is a storyline that could have a fantastic payoff if it’s built at the right pace and tempo. 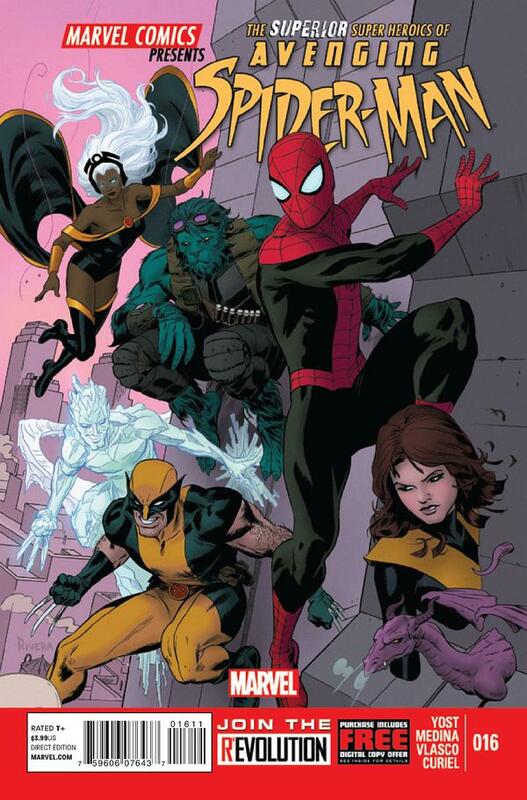 It took Slott exactly 100 issues in ASM-time to pay off his arc with the Octobots. However, some of these early explorations of Superior Spider-Man, may inadvertently sabotage the potential slow-burn that will make however this storyline is ultimately resolved, more satisfying from my perspective. It certainly doesn’t have to be 100 issues worth of build and resolution – but we’re hitting some major conflicts within the first three issues of this character’s existence (where’s Peter? How will Spidey-Ock react around other heroes? What will they think of him?). Marvel should be wise not to burn through too many more so soon.